With the development of LTE networks, LTE Advanced is now becoming the mainstream. So the LTE-A WiFi Routers are more and more popular, which would provide faster speed than that on LTE category 3 or LTE category 4. Huawei E5186 is the world’s first LTE-A router and was very popular in 2016 and 2017. Now the new upgraded Huawei B715 router is available. 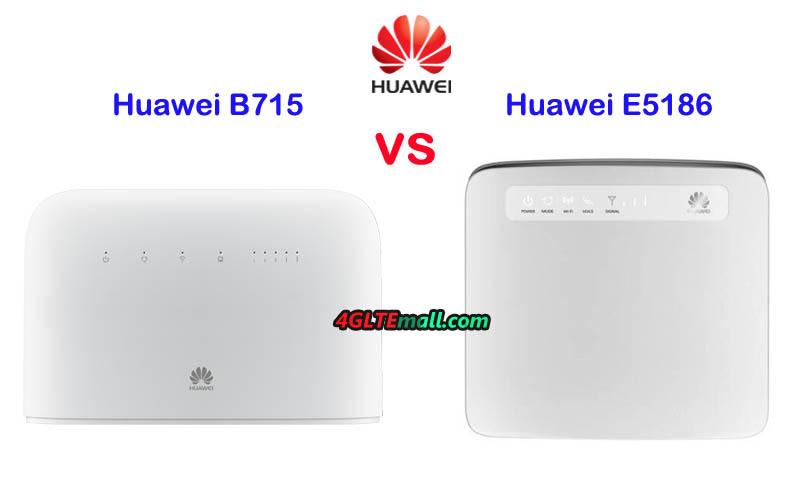 In this article, we will compare Huawei E5186 and B715 router to see what the difference between the two routers is and which one is better. Since Huawei LTE CPE E5186 was popular in Europe and Australia in past two years, many people may know it well. Like many other Huawei stationary routers, there are few indicators on the front, such as Power, Mode, WiFi, Voice, Signal. And Huawei logo is in the middle front face. On the back, there are 4 LAN ports (one for LAN/WAN), two RJ11 Telephone port, and USB 2.0 port available. The power switch on/off button is also lined with the interfaces. Huawei Router B715 also has 4 LAN ports (One for LAN/WAN), but it has only one telephone port with the USB 2.0 port. They both use Micro SIM card size. 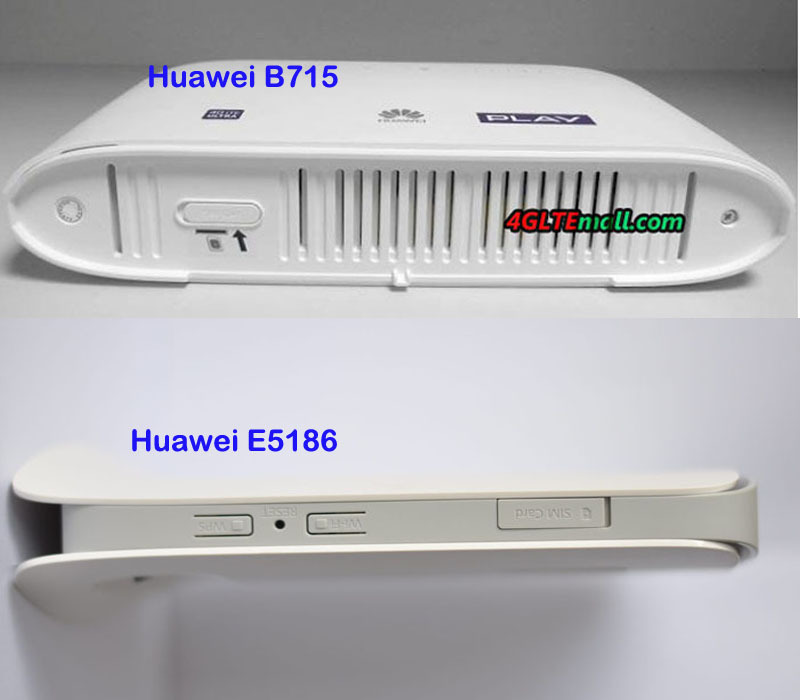 The difference is that the SIM card of Huawei E5186 is located on the edge side while Huawei B715 router has the SIM card slot at the bottom. And they both have two SMA connectors for an external antenna. If you would buy 4G LTE Antenna with two SMA connectors, you can switch the internal antenna to external antenna in the web interface. 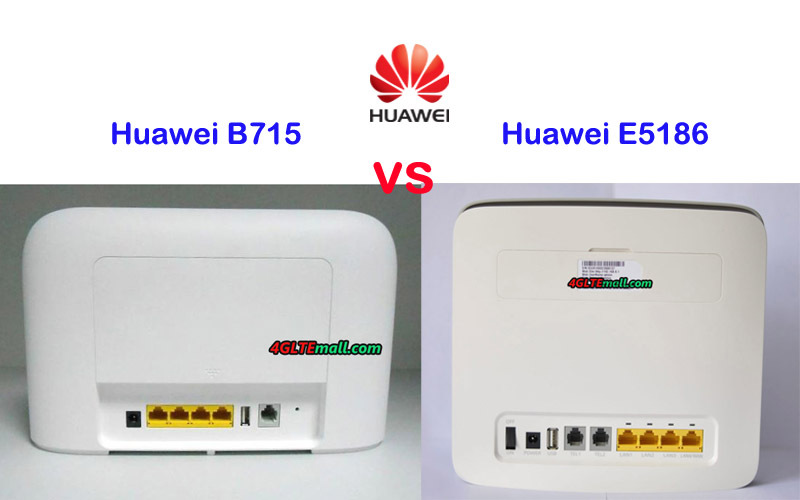 It’s obvious to see that the Huawei B715s-23c router is more advanced than Huawei E5186. The Huawei E5186 supports LTE category 6 technology which could achieve download speed up to 300Mbps, which is good for most people in daily life. However, the more advanced Huawei B715 would support peak download speed up to 450Mbps, which is 1.5 times faster than that of E5186. Although we didn’t know the chipset model of Huawei B715, the Huawei B715 seems powerful on the LTE technology, including carrier aggregation, 4 x 4 MIMO, TDD&FDD networks support. 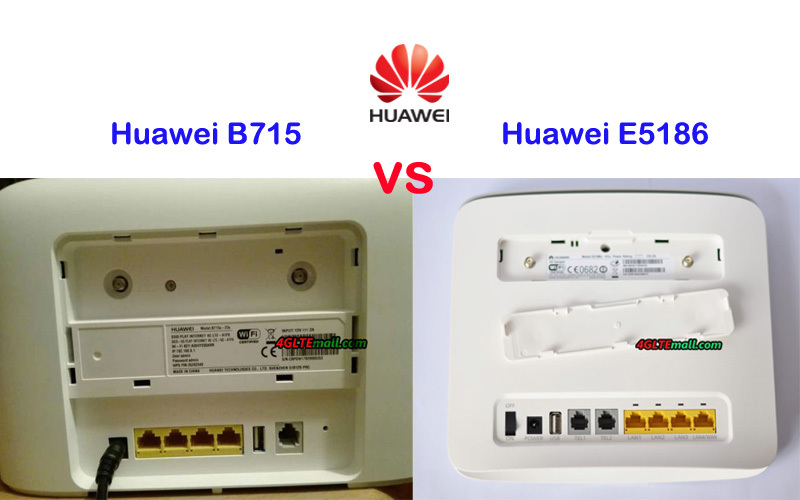 So you want to buy a better Huawei LTE-A router, it’s no doubt that Huawei B715 is the right model. However, as we said, the Huawei E5186 is enough for most cases in daily life or small office. With budget price, if you want to get a decent router without a high price, Huawei E5186 is highly recommended. It’s popular in the past two years and gains high praise from thousands of users worldwide.